Well I fished a local pond yesterday and accomplished squat! I didn't catch a darn thing. So this morning I decided that because it was warming up and it was Tuesday (probably less people fishing) I would head back out to that pond. I didn't have any shiners but the day before I bought a few and some maggotts in various colors. I figured the maggots would work well to keep in the fridge for another day and I'd use up the shiners when I had the chance the day before. So I walked out to a barren pond, and it was nice and then another guy showed up and we walked a ways together before I decided to set up shop. I did exactly as the guy at the bait shop said and strung on a bunch of them maggots on a silver swedish pimple jig and as soon as I sat in my chair, the rod dip dived for the hole. 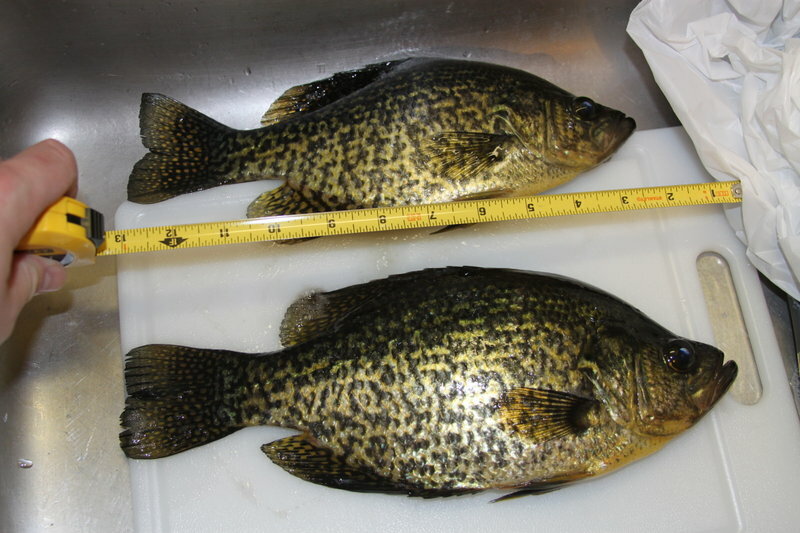 It was a beautiful black Crappie about 12 inches of fat fish. Shortly after I pulled up a 2-3 inch yellow perch and then another and another.... I managed to get one 4-5 inch blue gill between the tiny perch, and just before I packed up I moved and hit another good Crappie. So I decided I was keeping them and bagged em up and headed home. When I got home I prepared the sink for some gruesome work and quickly found it to be too low to work a fillet nice in, and moved to the counter, and This is where I learned my first valuable lesson about fish preparation. Make sure the damn things are dead before you cut them and get em all bloody and they flop and spray blood all over your kitchen! Oh and a SHARP knife is great if you don't want to struggle and nearly cut your fingers off. So after redoing all the clean dishes that got sprayed and washing and disinfecting the whole kitchen, I decided to let teh fillets soak and get ready for bed. Good looking fish Theron, have you eaten them yet?? P.S. Theron I moved this to Ice Fishing Reports. Nice lookin fish there buddy ! You need to get one of those fish boards at Wally. They have a spring clip at the small end that has jaws like the old bear traps. You just snap it on the fishes head and you're good to go. In the field for shore lunches I use a Rapala that is honed razor sharp, and I do mean razor sharp. At the cabin, to Hell with the standard fillet knife, use the electric fillet knife you can also get at Wally for short money. You come in just behind the front fin and cut straight down till you hit the backbone. Then roll the knife and slice just along the backbone all the way to the tail and right through and off. You'll have a fillet that only has the rib cage left in it. I use a fork to pin the fish to the board and use the tip of the knife to cut out the rib cage. You cut just under the cage and follow it right around. Next, you pin the fillet flesh side up on the board with the fork right at the very tail end. Now cut just in front of the fork and follow the skin line right up to the front of the fillet. When you get the hang of it you'll have fillets that look like they come out of the fish monger at the fish market. Flip the fish over on the board and do the other side the same. Sometimes if I'm doing a lot of fish I'll do all the slabbing first and then do the ribs and skin. Six of one half dozen of another. I can easily do over a hundred kivers in an hour using this method, and you'll never find a bone one. I do it on kivers, perch, bass, and crappies. Trout I smoke whole and the meat just slides off the bones. Salmon and Lakers I slice like swordfish if I'm fryin em, otherwise they get smoked too. Lot of folks won't eat pan fish because of the bones and they're really missing some excellent table fare. If you do as above you won't have a bone one. Well this warm weather scares me a bit as it keeps melting away at the ice. I actually saw a truck on the ice today. With 6" I'm thinking that isome kind of bravery or stupidity maybe. I have not eaten the crappie yet. I had to get some sleep, since I was running on little following a third shift and had another ahead of me tonight. The fillets are soaking inthe refridgerator in salt water at the moment. So Koda m ight you be interested in possibly smoking up some trout for me if I manage to get some? I would be willing to compensate as necessary. Maybe some extras for you or even some cash. I've never had it and thought it might be soemthing I'd like. Well back to work. Catch up with ya all later. That's queersome Brother. Fresh fish has no odor. Stuff that hangs around in the fish market well that's another story. For me, it's the stench of store chicken and turkey. They push so much medicated grain to the fowl you can smell it plain as day. Then Doc can't figger out why of a sudden we're allergic to anti biotics. Duh. All times are EDT. The time is now 01:09AM.